A stock, out-of-the-box Syncro performs fairly well. The Volkswagen engineers did a good job of building a tough and reliable (with proper maintenance) off-road vehicle. But it is clear they envisioned the T-3 as a sufficiently robust platform to permit performance enhancing modifications that would enable the Syncro to withstand Journeys Under Difficult Conditions. And because of the many privateer inventions and modifications available, Syncronauts are blessed (or cursed ;-) with an abundance of opportunities to upgrade and enhance the performance of their Syncros. Upgrades and modifications should be well planned and carefully executed or performance and reliability will suffer. Know what the trade-offs will be before proceeding with any change. Stay as close to stock specs and tolerances as possible to achieve your goals. Decide early on what kind of syncro will best serve your needs. Some prefer to maximize extreme off-road capability above all else. Others compromise and build dual-purpose Syncros that have decent off-road capability, but which also retain decent paved-road performance. Determining overall goals for the vehicle will help determine which trade-offs to make, and which not to make, when considering upgrades and modifications. 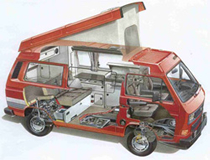 The Westfalia camper package is wonderfully designed and can be nicely enhanced with many different types of modifications and upgrades.